Even though this week promises to be a scorcher, it won’t stop Orquesta GarDel from playing back-to-back outdoor festivals. Some of the members of our newfound brothers in Afro-diasporic grooves are also part of Live Original Local, a Greensboro organization that “plans community events that bring together live music, original art and craft vendors, and local businesses.” On Saturday, July 7, GarDel hits the main stage at the second annual WalkerFEST, a free street festival near downtown Greensboro. The music lineup consists of killer bands across many genres like Orquesta GarDel (naturally) and The Brand New Life , but also avant-rock trio Hammer No More The Fingers (sporting a new EP), and festival-favorite Holy Ghost Tent Revival. Our set starts at 5:30pm. 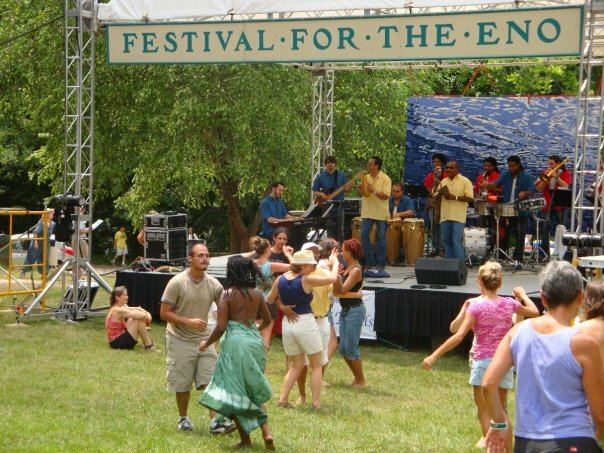 After a dip in the pool and a night’s rest, we will reappear at Durham’s legendary Festival for the Eno, which is practically synonymous with “Fourth of July.” This will be our fourth (fifth?) straight year playing at the festival, and we are always impressed with the number of dancers willing to brave the heat, discard their shoes, and get down in a field. But its always the toddlers running away from the family picnic blanket who have the sweetest dance moves. You can find information about tickets and parking at the bottom of this post. DJ Santa Salsera captured us playing our signature timba, “Lo Que Tú Querías” at the 2011 festival. Check it out and then come see us play our latest original timba, “Sin Ti” this coming Sunday!